When it comes time to teach the Christian faith, either to converts or children, it seems that the go-to moral code is the Ten Commandments. These ten simple rules were inscribed on stone for the people of Israel wandering in the desert, and were part of a larger law given to the people at that time. It is one of the simplest, oldest codes of morality in human history. For Christians, though, it seems like it is remedial at best. They are not even exclusively Christian anymore – lying, stealing, and killing are generally outlawed in any culture, and no sect is ok with profaning what they hold as sacred or important. When a rich young man asks him what must be done to inherit eternal life, Jesus first asks him about the commandments. The young man says he has kept them since his youth. Then Jesus tells him to go and sell everything – a command not found in the 10 commandments – and the young man goes away sad. Jesus remarks about how difficult it is for a rich man to enter heaven. In Matthew 25, Jesus tells the parable of the goats and the sheep. The goats are denied entry into heaven, even though they call their judge Lord. The difference between the two groups is the acts of charity, or works of mercy, that were or were not done. Feeding the hungry, clothing the naked, and visiting the imprisoned. It is not against the commandments to not do those things, but apparently it is enough to deny one entry into heaven. Put bluntly, you can keep the Ten Commandments and still go to hell. The world knows this. Christians can keep the 10 Commandments and feel self-righteous, yet still be jerks. Even someone vaguely familiar with the gospels can point out that Jesus was calling people to much more than keeping 10 simple rules. The 10 Commandments did not pass away or expire. You absolutely should keep them. But keeping them is a baby step for a Christian – like giving an Olympic athlete a medal for finishing a race, or thinking your marriage is great because you don’t cheat on each other. It should be a given. Even as we fail to keep them, and pick ourselves up again, we should be aiming higher. What then should we teach as moral principles? I have seen several sources recently point to the Beatitudes. Those are terrible goals, because they are not goals, they are effects. It’s rather like saying the goal is to be happy, when happiness is not an object that can be pursued, but the result or effect of something else. If you are living as a true follower of Christ, you will be persecuted. But you don’t get there by going into a public place and demanding that people persecute you; if you actually follow Christ’s teachings in a fallen world, you will experience persecution. Then, blessed are you. The Beatitudes lack the direct command of the commandments or the concrete task list we find in the parable of the goats and the sheep. Thou shalt not kill. Feed the hungry. Blessed are the meek. The first two give you a clear, firm prohibition or instruction, the last one just describes a divine effect for a particular state of being. We should look to be the kind of people that the Beatitudes describe, but we don’t go about that by trying to force the effects or states of being. If we want a set of ideals that will take a lifetime to perfect, I suggest we turn again to the virtues – those three chief virtues identified by the Apostle Paul in 1 Corinthians 13:13, and the four virtues identified in Wisdom 8:7, otherwise known as the Seven Heavenly Virtues of Faith, Hope, Charity, Prudence, Fortitude, Justice, and Temperance. In them we see how the rich young man may have failed at temperance or justice, but kept the commandments, or how Dives failed to show Charity and Justice to Lazarus, while not necessarily breaking any commandments. 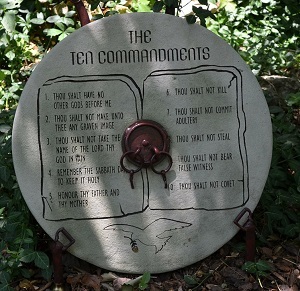 If we Christians spent our lives doing the works of mercy and striving to perfect the seven virtues in our lives, it would look much different than the lot of us resting on the fact we know and keep the Ten Commandments. Our lives would look a lot more like Christ’s.